EDISON, N.J. (WABC) -- A family in New Jersey is elated after they have gotten back an irreplaceable package that had been stolen from their front porch in Edison. Lyndhurst Police pulled over a van and the quilts were inside! The Edison Police Department had provided pictures to the surrounding areas so that they were aware they were stolen. The quilts were returned to the Edison Police Department on Friday, and then to the Delmonaco family Monday afternoon. The heartless thief was seen on surveillance video calmly walking up to the door carrying a pillow and then stealing the memories of their beloved son last month. This insensitive act angered many because the culprit took memory quilts made by a mother to remember her son who died a year ago. "That's all we have really are his memories and some of his things," said Karen Delmonaco, Robert Delmonaco's mother, last month. 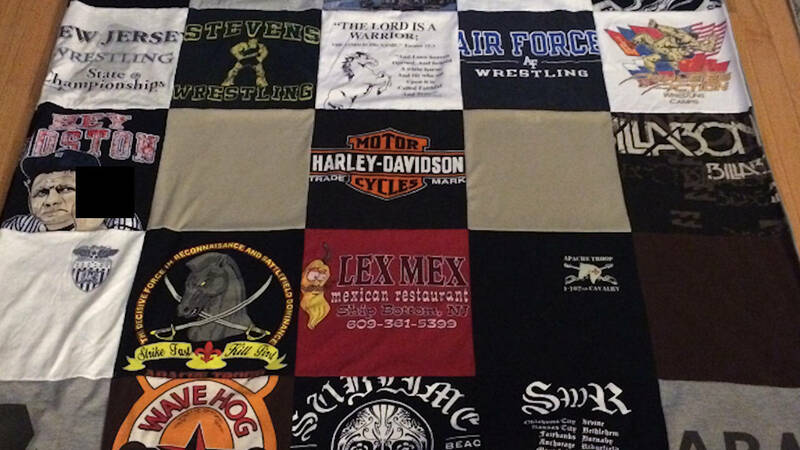 The quilts made of her son's t-shirts are now back in time to be Christmas presents for Robert's family members. They had been sent to a company to be stitched together. "You know it's something that you can just keep in one place and just have different memories from each shirt when you look at them, and hopefully you know, have good memories," Karen said. Robert Delmonaco was in the 102nd Calvary, an honor student, graduate of Valley Forge Military College, until his life ended. The thief had scoped out this neighborhood before stealing this precious package. There's no word yet on any arrests as a result of the quilts being found.